For Gustav Klimt The Kiss Painting, we have two ratio versions, see square one at bottom. Size 27"width by 34"height is prepared, full ready to be shipped.The Kiss by Gustav Klimt was painted between 1907 - 8, during his 'golden period', and is probably his most famous work. 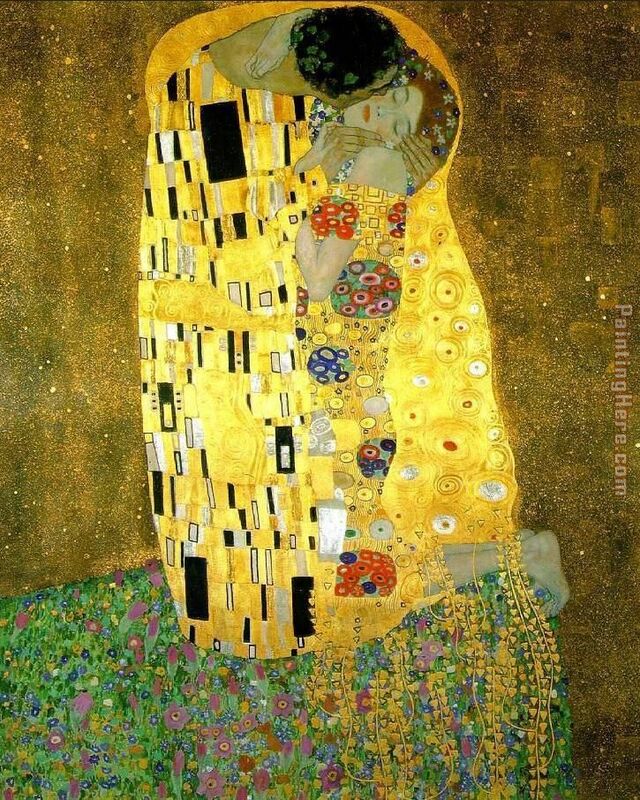 In The Kiss, Klimt depicted a couple locked in an embrace, sharing a kiss against a bronze background. All shrouded in symbolically patterned gold. A bed of flowers below them. Some think that Gustav Klimt and his beloved companion Emilie Floge modeled for the masterpiece. The kiss painting is currently at the osterreichische Galerie Belvedere museum, in Vienna, Austria. Gustav Klimt and "The Kiss" were selected as the main motif for a collectors' coin, the 100 euro gold The Painting coin issued on 5 November 2003. Gustav Klimt was one of the most prominent members of the Vienna Secession movement. Beautiful, original hand-painted artwork in your home. Interpreted paintings based on the masters' works of Gustav Klimt.This The Kiss (Le Baiser _ Il Baccio) needs about 14 - 16days for production by a talented artist. If you're not happy with Gustav Klimt The Kiss (Le Baiser _ Il Baccio) that you made on PaintingHere.com, for any reason, you can return it to us within 50 days of the order date. As soon as it arrives, we'll issue a full refund for the entire purchase price. Please note - PaintingHere.com does not reimburse the outgoing or return shipping charges unless the return is due to a defect in quality. If you want to purchase museum quality The Kiss (Le Baiser _ Il Baccio) at discount price, why not give us a try? You will save a lot more! This Gustav Klimt The Kiss (Le Baiser _ Il Baccio) needs 14 -18 days for production time frame. We ship all over the world. We can provide The Kiss (Le Baiser _ Il Baccio) Painting stretched canvas and large framed art.